- ALEXA COMPATIBLE DEVICES: Compatible with iOS, Android, Amazon Echo & Alexa and Google Home. Perfectly works with smartphone and routers, download the TUYA App to control it, just requires wifi(2.4GHz) to get a start. 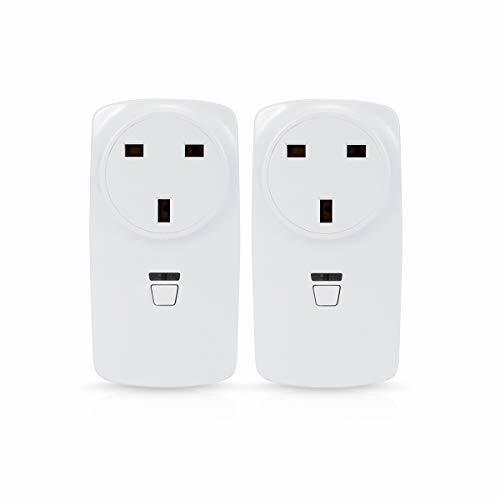 - TIMER SWITCH & COUNTDOWN FUNCTIONS: Set a timer on the outlet with your phone, you can also schedule the WIFI Smart socket to automatically power electronics on and off as needed, keep your devices safe with a longer life, do not worry again about being overcharged. - WIFI REMOTE CONTROL: Amazing WIFI Smart Plug makes your life easier and convenient. Allows you to connect wirelessly to control the power to devices plugged into this WIFI socket. Ideal for anyone who wants to control their home through one centralized device. - EASY TO USE & SET UP: Scan the QR code on the user manual and install the APP for free, connect the socket, done. You can manually press the button on the socket to turn on/off. - CREATING INTELLIGENT LIFE: Share the device with the added family members.The App "TUYA" enables you to control your home appliances easily. Such as lights, air conditioners, microwave ovens, Wifi routers, coffee grinders etc.